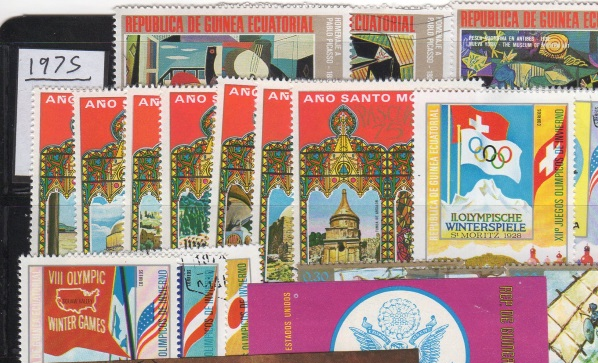 The stamps of Equatorial Guinea are, plentiful, colorful, and for a period from about 1972 through 1979, primarily bogus. 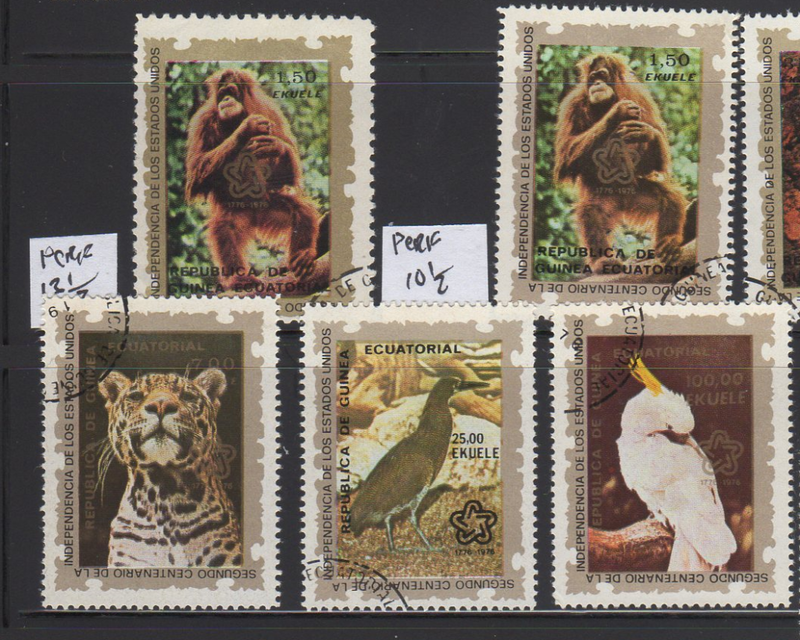 In fact, even though for a few years prior to 1972, and most years since 1980, Equatorial Guinea issued legitimate stamps, these are very hard to come by mint or used. A search on eBay does not yield much outside of the wallpaper era. Keijo at StampCollectingBlog has a nice writeup on the history of the period here. 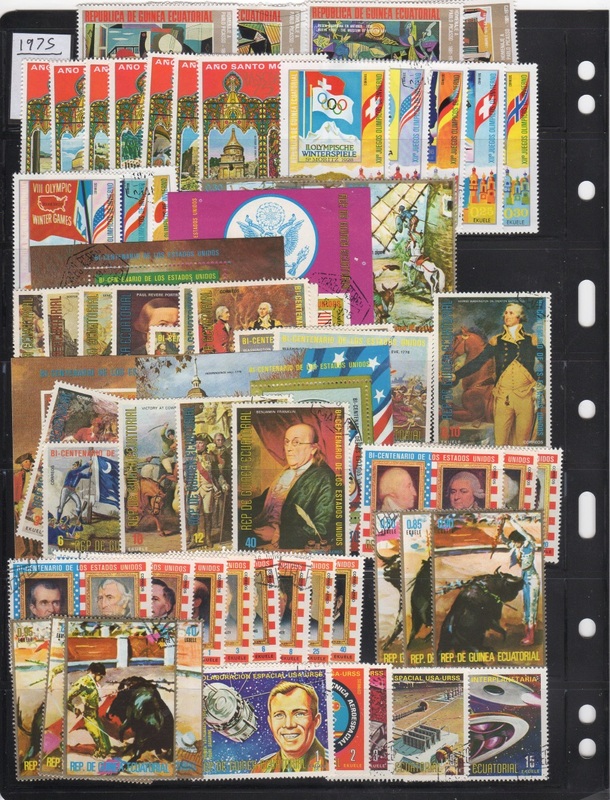 When it comes to issues like these, and counties or periods with large colorful stamps, one of the problems a collector runs into is how to store/display them in their collections. I have opted for a method which is more on the “storage” side of things than the “display”. In short- I pack them into my stock pages. It looks kind of messy, yes, but, stock pages aren’t cheap, and for these issues, it makes more sense to me to load them up like this. I do try to leave at least the Face Value of each stamp sticking out just enough so I can see which values I have of each set. The overprint on the left is referencing the Apollo mission, along with what appears to be a Russian Space Mission of some sort. 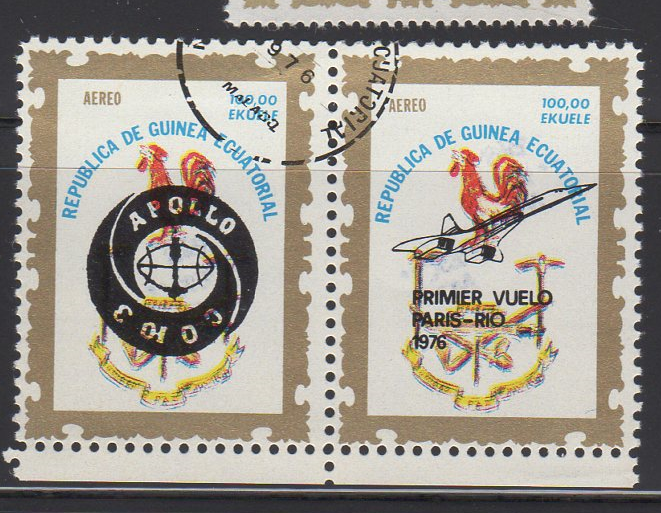 The overprint on the right relates to concord flights from Paris to Rio. Strange…totally bogus…but, interesting anyway. Or, in the case of even more unlisted goodness, have a look at these oddball stamps. Scott does not list them, but StampWorld does, these are “American Bicentennial” stamps, that depict, jungle animals from Africa. All I can say is: “LOL”. I separated them out because I noticed a perf difference in the 1.50e value. Like most things, I enjoy collecting these bogus issues because I think they continue to tell a story about philately, regardless of whether or not these stamps were ever used on letter from Africa to anywhere at all. nice post. Sad to admit but my Equatorial Guinea looks more or less the same right now, LOL. Too many stamps/additions crammed into too few stockbooks, will likely need to buy 3-5 new 32-page stockbooks before getting the visual side back to way I prefer. 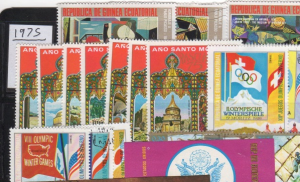 As for US Bicentennary stamps, they are Michel #844-850. Nice job for spotting the perforation variety. I wonder if anybody has ever collected a ‘complete’ range of these. It would make a pretty interesting display of ‘philatelic agencies’ history, but would also likely prove much more challenging (and expensive) than most would assume. Thanks Keijo for the Michel Reference, I have updated my inventory! Also I suspect that maybe these stamps were printed by more than one agency? – Some of them just have a different “feel” than the others. In recent years Michel has declared several of late 1970s issues (usually those with ‘different feeling’ such as square/round postmark instead of standard hexagon) as bogus. I would not be surprised if the listings were further modified when further research is completed. A bit of the same situation as with many of the sand dunes. Likely in decade or two there will be a much better and wider understanding for these stamps, as well as what is legit and what is not.